As Avengers: Infinity War slows down a bit, nearing the end of its successful box-office run, the focus will gradually shift towards Avengers 4. Until such time as official news about the movie begins making its way on the blogosphere, we have to contend with plot rumors, proposed theories and leaks. We now have what is possibly the first concrete leak from Avengers 4 depicting two concept arts. One of these shows the team in action while the other shows Thanos all armored up to fight the new assembles. Check them out in the gallery below. One of the chief concerns with leaks of this kind is their authenticity. These come from a Brazilian website and are being vetted as authentic across the web for several reasons. Most important of these is the look for The Hulk, who now has significantly more shades of Banner and is even suited up in his own way. It’s hard to imagine a fan could’ve come up with something as original as this. This transformation should eventually complete the three-movie arc for Hulk that Mark Ruffalo teased, beginning with Thor: Ragnarok, where Banner possibly makes peace with the Hulk, gaining the ability to summon him at will. 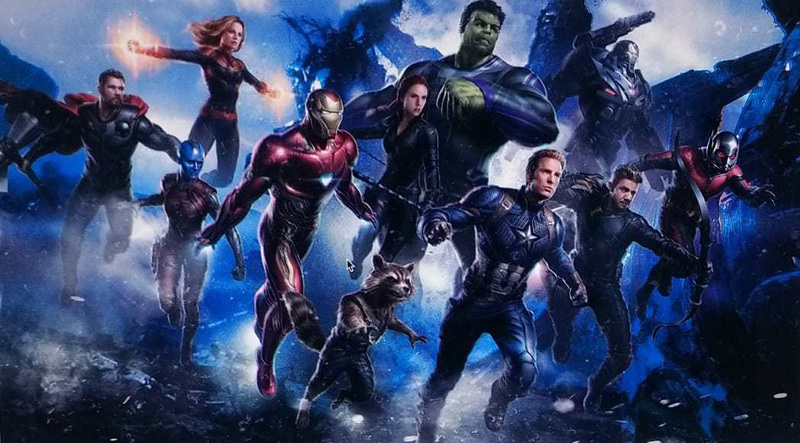 Everyone else is suited up in the most recent versions of their costumes, whether its Iron Man with his Nano-Tech inspired suit, Thor with Stormbreaker, Ant-Man in his updated look from Ant-Man and the Wasp or Hawkeye with his purported Ronin makeover. The females Captain Marvel, Black Widow and Nebula round up the superhero team-up along with Rocket. Strangely the Wasp is missing which leads us to speculate if she’ll be the one to perish at the end of Ant-Man and the Wasp as a result of Thanos’ snap, consequently drawing both Scott Lang and Hank Pym into the conflict. 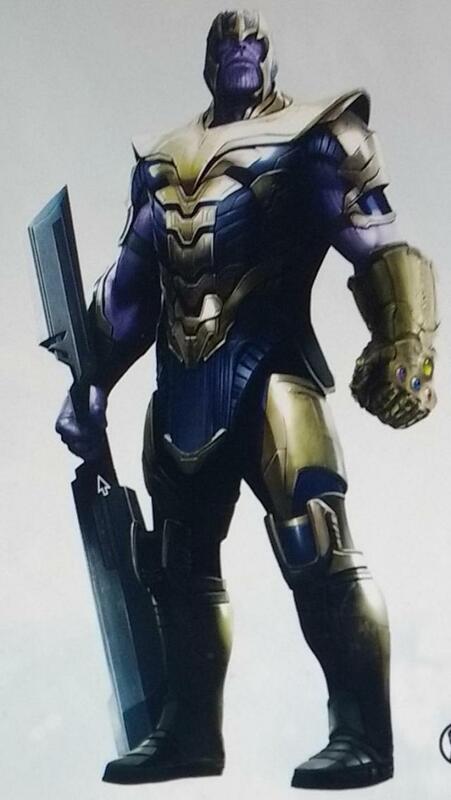 The second leak shows Thanos fully armored and outfitted with what looks like a gigantic sword. It resembles the Thanos before he got the Infinity Stones which makes us wonder if this is from a flashback sequence on Titan, or if Thanos ends up losing the Infinity Stones? And if so, do the Avengers manage to reclaim the gems from the Mad Titan himself? Right now theories, questions and pondering is all we fans can do until Marvel Studios treats us to the first official teaser or trailer for Avengers 4. And from the looks of it, that isn’t slated to happen anytime soon. Hell we’re still awaiting the movie’s title. What do you think of these concept arts? Sound off in the comments below. Avengers 4 releases on May 3, 2019.